29 March 2019 Congrats to Ellery McNaughton who submitted her PhD thesis today! Congrats to Dr Carolina Lara Mendoza – who was awarded her PhD. Carolina is off to Christchurch with her partner and will be on the look out for jobs! Congrats to Dr Anna Probert – who was awarded her PhD. Anna is off to Switzerland for a postdoc working in Sven Bacher’s lab. 31 October 2018 Congrats to Carolina Lara and Anna Probert – both submitted their PhD theses! Daria Erastova was awarded $5500 by Birds NZ for her project on the effect of sugar-water feeders on native bird behaviour and welfare. 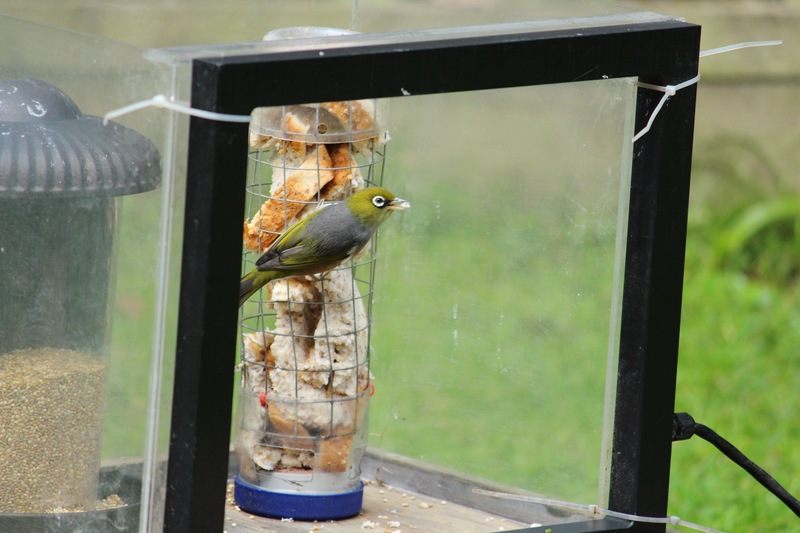 Daria Erastova was awarded $4500 by JS Watson fund (Forest & Bird) for her project on the effect of sugar-water feeders on native bird behaviour and welfare. Our group did pretty well at the annual School of Biological Sciences Research Awards for 2017 – with 3 wins! RSNZ Science Teaching Leadership Programme participant, Helen Armstrong has joined us from East Tamaki School. Helen will spend the semester working with Cate’s group and the wider team. Welcome Helen! Margaret, James and Bruce were promoted to Associate Professor and Jacqueline was promoted to Professor in the recent promotions round. Congratulations all! Jamie Stavert’s PhD thesis was included on the Dean’s list for academic excellence. Congratulations Jamie on an outstanding body of work. You can read some of Jamie’s posts here and here. Green roofs provide an opportunity for conservation in urban areas. Read Cate’s piece posted on the Journal of Applied Ecology blog. A wonderful video on NZHerald site which interviews three of EEB’s postgrad students (including Ecology Ngātahi’s Jamie Stavert) about the conservation policies of political parties in the lead up to the election. From January 2018, Cate will be joining Te Pūnaha Matatini, the Centre for Research Excellence in Complex Systems as a Principle Investigator. After the release of a report on the spread of kauri dieback in Auckland’s Waitakere Ranges, Cate provided comment on the Science Media Centre website. 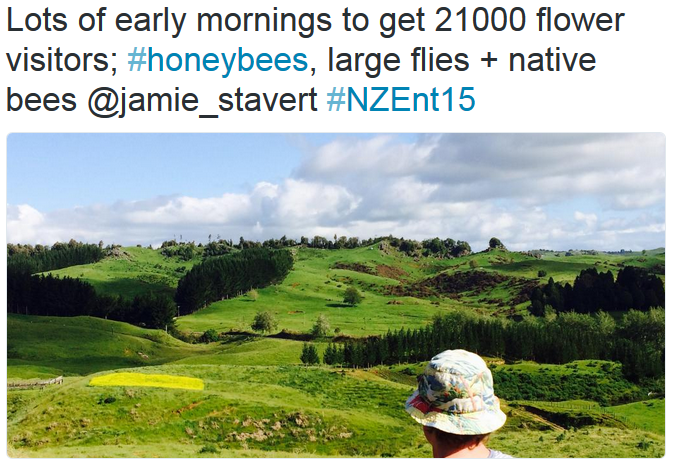 Jamie Stavert was on RadioNZ talking about his latest pollination paper. Margaret Stanley took part in NZ Herald’s Sustainable Cities Series: buff.ly/2uX5nVo and tried to make a case for integrating biota into cities. PhD students Ben and Zach join the group. Nau mai! Congratulations to Josie Galbraith who won the Marion Cranwell prize ($3 000) for best 2016 MSc or PhD thesis on an ecological or environmental issue. Margaret Stanley, Carolina Lara, Ellery McNaughton & Josie Galbraith showcased their Wild Cities Urban Ecology research at the University of Auckland Celebrating Research Excellence function on 8th May. They did a marvellous job of explaining their research to the Minister for Science Paul Goldsmith and various other dignitaries. Hear Margaret Stanley talking about myrtle rust in the context of the biosecurity system on TV3’s “The Project’. On Demand Episode 5/5/17 at 26:30mins. Congratulations to Ecology Ngatahi members who graduated on Monday! Listen to Cate Macinnis-Ng on the Science Report with Graeme Hill. Josie Galbraith has been awarded a place on the Dean of Graduate Studies List (Dean’s List) in recognition of excellence achieved in her PhD thesis. Congrats to Robert Vennell – who won an Enderby Trust scholarship to visit the subantarctic islands in December. Tom Saunders has taken out a Merit Award for his poster at the Faculty Postgraduate Poster Competition – with his poster going through with the top 20 FoS posters to the University Exposure competition. Carolina Lara was awarded $4000 by the JS Watson Trust for her project on the effectiveness of ecological corridors in maintaining bird movement and seed dispersal. MSc students Robert Vennell and Tom Saunders made it to the finals of the University of Auckland ‘3 Minute Thesis competition’, with Robert winning ‘Runner Up’. Anna Probert was awarded $8000 – from Todd Foundation Awards for Excellence (Universities). Jessica Devitt won the Marion Cranwell prize (joint winner) for best 2015 MSc or PhD thesis on an ecological or environmental issue. Anna Probert has been awarded $1000 by the Royal Society’s Hutton Fund for her PhD research on using exotic ants as a model to assess risks to native ecosystems. Robert Vennell and his MSc on quantifying feral pig damage functions is in the news! PhD student Patrick Garvey won the award for Best Student Presentation at the Australasian Wildlife Management Society Conference in Perth, WA. Ecology Ngatahi launches it’s youtube channel with a fantastic animation based on Josie Galbraith’s research. Assoc Prof. Jacqueline Beggs Te Tohu Taiao Award in recognition of sustained and unique contribution to invertebrate ecology in NZ, mentoring and outreach roles and also leadership among the ecological community. Josie Galbraith, PhD student, was awarded a prize for the outstanding publication on an aspect of New Zealand ecology (not limited to the NZ Journal of Ecology or early career folks). Galbraith J.A., Beggs J.R., Jones D.N., Stanley M.C. 2015 Supplementary feeding restructures urban bird communities. PNAS 112(20) doi: 10.1073/pnas.1501489112. PhD student Rachael Sagar was awarded 2nd prize for best student talk at the World Seabird conference in South Africa. This is an excellent achievement given the number of students presenting! NZ Herald piece describes ‘10 climate change canaries‘ profiling ecology studies from across the country that involve exploring the impacts of climate change on New Zealand’s unique plants and animals. Jamie Stavert was awarded a Claude McCarthy Fellowship to enable him to travel to the USA in 2016. Jamie will visit Rachel Winfree‘s lab (Rutgers University, New Jersey) as they work on the ecology of pollinators and the pollination function they provide in the context of global change. Jamie will also attend the XXV International Congress of Entomology in Florida. Huge congratulations to Cate Macinnis-Ng for being awarded a 5-year Rutherford Discovery Fellowship. Only 12 of these prestigious awards are made each year to some of New Zealand’s most talented early to mid-career researchers. 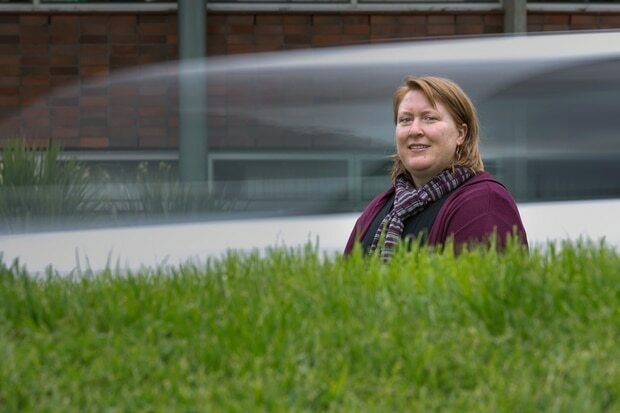 Cate is a plant ecophysiologist and ecohydrologist who investigates the mechanisms of plant interactions with the environment with an emphasis on plant water use. Her research involves quantifying carbon sequestration in native forests, managing water resources during dry periods, determining plant responses to climate change and the potential of plants in climate change mitigation. PhD student Rachel Sagar is studying the ecophysiology and breeding ecology of seabirds. Well done to all our PhD students who gave such great talks at the first year PhD seminar day. 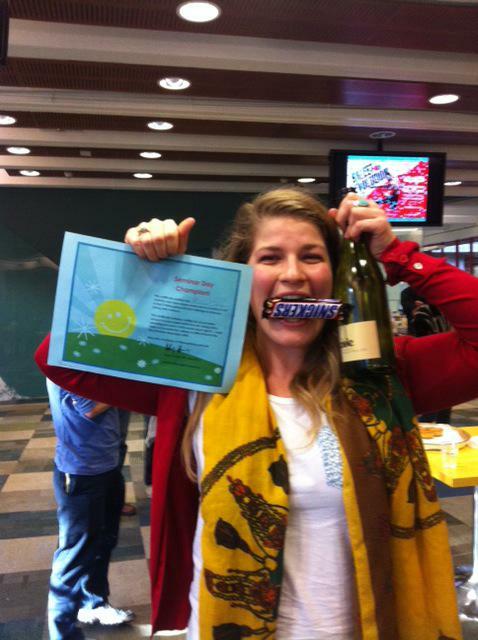 Congrats to Rachel Sagar (co-supervised by Margaret Stanley) who won the overall prize for best speaker. Nice job! Fantastic media coverage of our paper on urban tree protection – a selection of links including to the paper. Wyse, S. V., J. R. Beggs, B. R. Burns, and M. C. Stanley. 2015. Protecting trees at an individual level provides insufficient safeguard for urban forests. Landscape and Urban Planning 141:112-122. PhD student Jamie Stavert received a Todd Foundation Award for Excellence for his project Using mesocosm [large enclosure] experiments to manipulate pollinator communities and determine how the composition and diversity of biological traits influence pollination – a critical ecosystem function and service. Jamie was awarded $8000. PhD student Josie Galbraith’s research was published in PNAS today!! Josie A. Galbraith, Jacqueline R. Beggs, Darryl N. Jones, and Margaret C. Stanley Supplementary feeding restructures urban bird communities PNAS 2015 112: E2648-E2657. 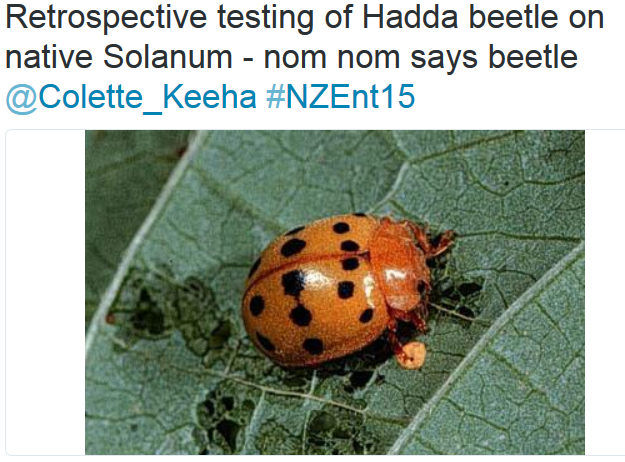 Congratulations to our award winning lab members – NZ Entomological Society conference was a great success for us!